On the 22nd (Mon), tour the pleasant surroundings at Royal Botanical Gardens, contemplate the long history of Temple of the Sacred Tooth Relic, then explore the different monuments and memorials at Kandy Garrison Cemetery, and finally explore the activities along Kandy Lake. To find traveler tips, more things to do, where to stay, and more tourist information, use the Kandy trip planner . London, UK to Kandy is an approximately 17-hour combination of flight and bus. You can also fly; or do a combination of flight and taxi. Traveling from London to Kandy, you'll lose 5 hours due to the time zone difference. Cap off your sightseeing on the 22nd (Mon) early enough to go by car to Anuradhapura. 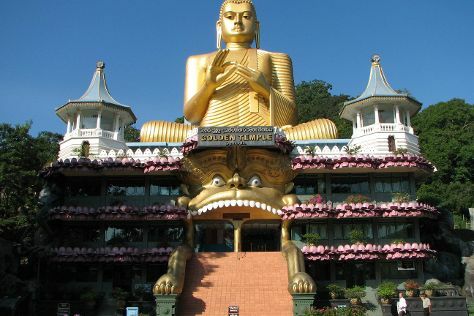 Kick off your visit on the 23rd (Tue): take in the spiritual surroundings of Ruwanwelisaya Dagoba, contemplate in the serene atmosphere at Mihintale, and then stroll through Golden Temple of Dambulla. 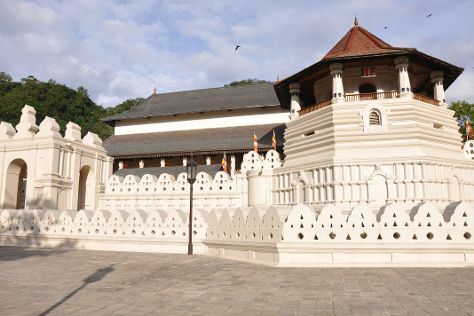 On the next day, contemplate in the serene atmosphere at Isurumuniya Temple, then take in the spiritual surroundings of Sri Maha Boodhi Temple, then don't miss a visit to Isinbassagala, and finally take in the spiritual surroundings of Thanthirimale Rajamaha Viharaya. To see maps, ratings, more things to do, and more tourist information, refer to the Anuradhapura online trip builder . You can drive from Kandy to Anuradhapura in 2.5 hours. Alternatively, you can take a train. Wrap up your sightseeing on the 24th (Wed) early enough to travel to Mumbai. Kick off your visit on the 25th (Thu): don't miss a visit to Dhobi Ghat and then appreciate the history behind Gateway of India. Here are some ideas for day two: snap pictures at Bandra-Worli Sea Link, then get outside with Marine Drive, then admire the landmark architecture of Chhatrapati Shivaji Terminus, and finally let your taste buds guide you at a local gastronomic tour. For photos, other places to visit, reviews, and more tourist information, you can read our Mumbai trip planning tool . Traveling by combination of taxi and flight from Anuradhapura to Mumbai takes 11.5 hours. Alternatively, you can do a combination of train and flight. In June, daily temperatures in Mumbai can reach 38°C, while at night they dip to 30°C. Wrap up your sightseeing on the 26th (Fri) early enough to travel to Jodhpur. 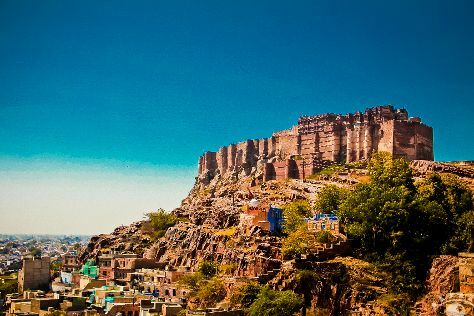 On the 27th (Sat), explore the world behind art at Umaid Bhawan Palace Museum, steep yourself in history at Mehrangarh Fort, and then kick your exploration up a notch at some of the top local zipline courses and adventure parks. To find reviews, where to stay, traveler tips, and more tourist information, go to the Jodhpur trip maker . You can fly from Mumbai to Jodhpur in 3.5 hours. Alternatively, you can drive; or take a train. Traveling from Mumbai in June, expect nights in Jodhpur to be about the same, around 34°C, while days are a bit warmer, around 47°C. Finish your sightseeing early on the 27th (Sat) to allow enough time to drive to Udaipur. Start off your visit on the 28th (Sun): browse the exhibits of City Palace of Udaipur, take in the spiritual surroundings of Jagdish Temple, and then explore the activities along Lake Pichola. For more things to do, ratings, traveler tips, and tourist information, go to the Udaipur trip itinerary maker app . Getting from Jodhpur to Udaipur by car takes about 4 hours. Other options: take a bus; or take a train. Traveling from Jodhpur in June, you will find days in Udaipur are little chillier (43°C), and nights are about the same (32°C). Finish your sightseeing early on the 28th (Sun) so you can travel to Jaipur. Jaipur is known for historic sites, museums, shopping, childrens museums, and wildlife. Your plan includes some of its best attractions: explore the historical opulence of Amber Palace, identify plant and animal life at Elephant Joy, admire the striking features of Jal Mahal, and see the sky in a new way at Jantar Mantar - Jaipur. For other places to visit, reviews, more things to do, and other tourist information, read our Jaipur trip planner . Traveling by flight from Udaipur to Jaipur takes 1.5 hours. Alternatively, you can drive; or take a bus. In June, daily temperatures in Jaipur can reach 47°C, while at night they dip to 32°C. Wrap up your sightseeing on the 1st (Wed) early enough to drive to Agra. Spend the 4th (Sat) on the rails with a train tour. There's still lots to do: steep yourself in history at Taj Mahal, admire the striking features of Tomb of Itimad-ud-Daulah, take in the local highlights with Walking tours, and don't miss a visit to Jahangir Mahal. To find ratings, photos, traveler tips, and tourist information, read our Agra day trip planning app . Traveling by car from Jaipur to Agra takes 3.5 hours. Alternatively, you can take a train; or take a bus. Expect a daytime high around 40°C in July, and nighttime lows around 31°C. Finish your sightseeing early on the 4th (Sat) so you can drive to New Delhi. New Delhi is known for historic sites, parks, shopping, museums, and fun & games. Your plan includes some of its best attractions: tour the pleasant surroundings at Humayun's Tomb, steep yourself in history at Gurudwara Bangla Sahib, let your taste buds guide you at a local gastronomic tour, and take in the spiritual surroundings of Birla Mandir Temple (Lakshmi Narayan). For ratings, photos, more things to do, and more tourist information, use the New Delhi tour itinerary website . Traveling by car from Agra to New Delhi takes 3 hours. Alternatively, you can take a train; or take a bus. Expect a daytime high around 41°C in July, and nighttime lows around 31°C. 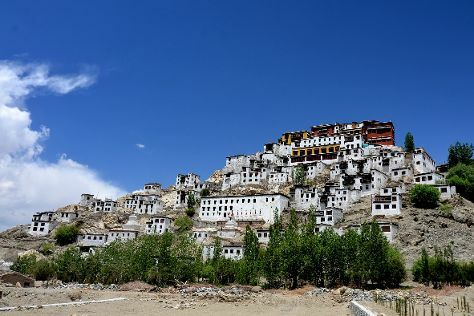 Wrap up your sightseeing on the 7th (Tue) to allow time to travel to Leh. Get out of town with these interesting Leh side-trips: Alchi Monastary (in Alchi) and Hemis Monastery (in Hemis). There's much more to do: take in the spiritual surroundings of Thiksey Monastery, examine the collection at Stok Palace Museum, appreciate the history behind Shey Monastery, and make a trip to Confluence of the Indus and Zanskar Rivers. To see maps, ratings, photos, and more tourist information, you can read our Leh trip website . You can fly from New Delhi to Leh in 3 hours. Another option is to drive. Wrap up your sightseeing by early afternoon on the 12th (Sun) to allow enough time to travel back home.